The Great Chinese Famine afflicted almost all Chinese people between 1959 and 1961. No study has explicitly assessed the association between an exposure to Chinese Famine and risk of overall breast cancer and tumor subtype. We evaluated the unique historical environmental influences of famine exposure on breast cancer subtypes. 16,469 Chinese women who were diagnosed with invasive breast cancer in the Fudan University Shanghai Cancer Center (FUSCC) from 1999 to 2014 were analyzed. Four tumor subtypes were defined by both estrogen-receptor (ER) and progesterone-receptor (PR) status. Multinomial logistic regression models were used to estimate the odds ratios (ORs) of ER−PR−, ER+PR−, and ER−PR+ relative to ER+PR+ breast cancer for exposure to famine and age at the exposure. Compared with cases not exposed to the Famine, exposed cases were more likely to be diagnosed with ER−PR− (OR 1.60, 95 % CI 1.43–1.81), ER−PR+ (OR 4.85, 95 % CI 3.80–6.19), and ER+PR− (OR 1.99, 95 % CI 1.67–2.37) than ER+PR+ breast cancer after controlling for established breast cancer risk factors. Women exposed to Famine after first birth had a higher risk of EP−PR− (OR 1.66, 95 % CI 1.28–2.15), ER−PR+ (OR 9.75, 95 % CI 5.85–16.25), and ER+PR− (OR 2.35, 95 % CI 1.69–3.26) compared to those with ER+PR+ breast cancer. Women exposed to the Famine, particularly those exposed after first birth, were more likely to be diagnosed with ER−PR−, ER−PR+, and ER+PR− breast cancer. 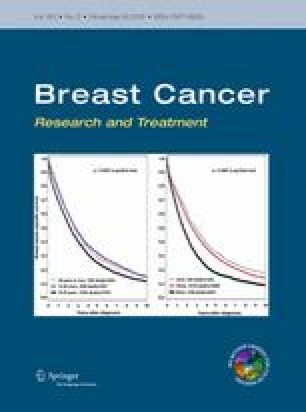 This retrospective analysis suggests that famine, malnutrition, or the associated lack of fruit and vegetable consumption in adulthood may be related to epidemiological heterogeneity within breast cancer subtypes. The authors thank the Shanghai Cancer Hospital for supplying the aggregate data, and Foundation for Barnes-Jewish Hospital for funding this study funds. GAC and YL are also supported by the Breast Cancer Research Foundation. Shanghai Hospital collected data through operation of its tumor registry. This is an international collaboration between Washington University School of Medicine and Fudan University Shanghai Cancer Center. Supported by funds from the Foundation for Barnes-Jewish Hospital and Fudan University Shanghai Cancer Center. GAC and YL were also supported by the Breast Cancer Research Foundation. The funders had no role in study design, data collection, analysis, interpretation of data, preparation of the report, or decision to publish. All authors had full access to all the data and analyses and had final responsibility for the decision to submit for publication. AA, GAC, and YL contributed to the design of the study. ZMS GYL, MM JW ZZS, and NSH contributed to data collection. AA, YL, MM, and WHX contributed to data review. AA and YL contributed to data analysis. AA, GAC, and YL contributed to data interpretation. AA, GAC, and YL contributed to the writing and revision of the report. AA searched the scientific literature, produced the figures and tables, and drafted the manuscript. GAC and YL contributed to the critical revision of the paper. All authors (AA, MM, YL, NSH, GYL, WHX, JW, ZZS, ZMS, and GAC) contributed to the review of the report and approved the final submitted version.